Our mirrors can brighten your gym, your exercise or sporting facilities. Our mirrors can transform your facility into a brighter, happier place. 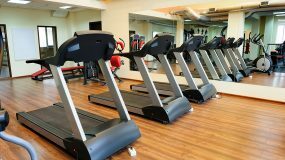 We specialize in working with the fitness industry – gyms, exercise or sporting facilities, dance studios, and home workout spaces. 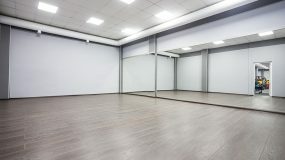 All mirrors are American-made in three sizes – 8 ft. by 4 ft., 8 ft. by 6 ft. and 4 ft. by 6 ft. — and a lifetime warranty on our workmanship is included with each installment. Pro-Bond Mirror has been in business for more than thirty years. It is fully insured, family owned and operated and is known for its friendly and reliable service. Contact us, tell us your requirements and our staff will design the perfect solution just for you. Mirrors enlarge and improve the appearance of rooms, giving students and other users the chance to see what they’re doing, helping them to improve in their particular field. Can you imagine how advantageous it is for a dancer to see his/her form? For gymnasts to check their moves? For a weight lifter to refine his/her lift? Call us today and we’ll be happy to discuss your custom needs.